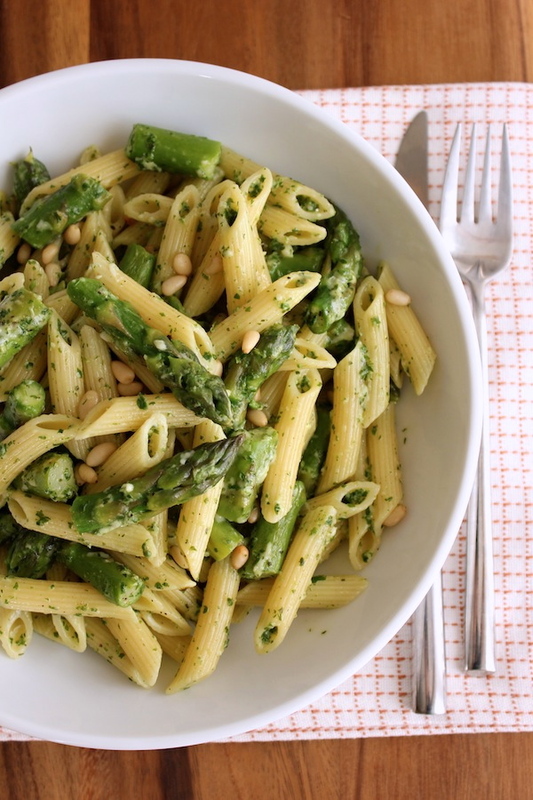 Penne with asparagus and lemon pasta – A bright and lemony pesto sauce with penne, asparagus and pine nuts. A quick and easy spring meal. Yesterday was one of those days that just got away from me. All of a sudden it was 5:30 and I still needed to do laundry, take the dog for a long walk (otherwise she’s nuts), pack up and clear everything out of the living room because the painters were coming in the morning and make dinner – all before 9pm so I would be ready for Game of Thrones! So penne with asparagus and lemon pesto to the rescue. A quick and tasty spring dinner. By adding some lemon to the pesto you create a herby, lemony, bright sauce that pairs really well with asparagus and pasta. This recipe is quick and fast – measure everything out before you begin cooking and have it all close at hand – while the pasta’s cooking, sauté the asparagus and make the pesto. You can have dinner ready in under 20 minutes – which is always a bonus in my books. This is a slightly deconstructed pesto – instead of adding the pine nuts to the pesto sauce I toasted them and sprinkled them over the pasta. I like the taste of the whole nuts versus blending them in to the sauce. Toast pine nuts over medium heat. Keep an eye on them or they will burn. I usually just keep shaking the pan until they are done. They only take a minutes or so to brown. I used a mixture of parsley and basil. All basil pesto is too strong a taste for me – I like the milder taste that parsley gives the pesto. This is not a thick and oily pesto. The lemon juice and a little pasta water lighten the pesto up considerably. This recipe couldn’t be more straight forward or easy but if you want to make it really easy just add some lemon to store bought pesto. 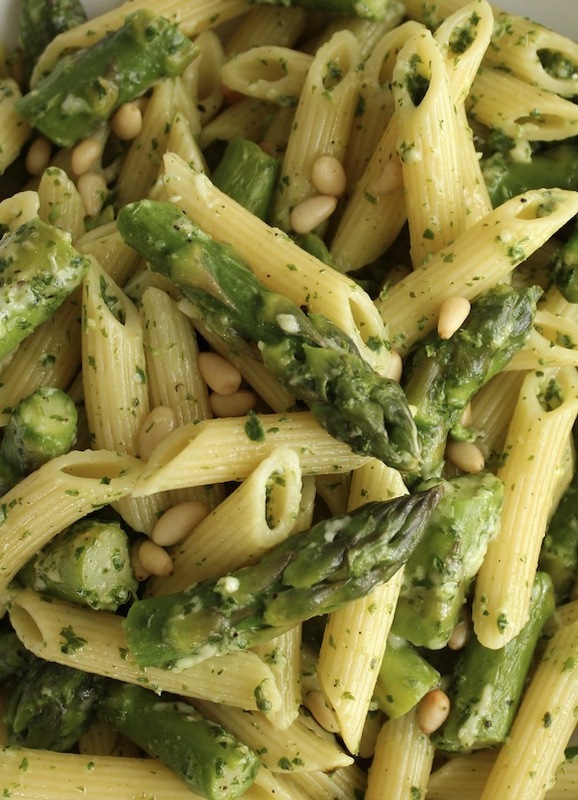 A bright and lemony pesto sauce with penne and asparagus. A quick and easy spring meal. A little pasta water – about 1 or 2 tbs. Bring a large pot of water to a boil. Add penne and veggie bouillon cube. Cooking according to package directions. Wash and snap off the tough ends of asparagus. Slice asparagus into 1 to 2 inch pieces. Heat a little olive oil in a sauté pan. Add just washed asparagus (with a little water clinging to the asparagus) and 1 minced garlic clove, cover pan and cook over medium heat for 4 minutes. Give the pan a shake after 2 minutes. Add lemon juice, parsley, basil, 1 garlic clove, olive oil, parmesan and black pepper to a mini food processor. Puree to create the pesto. If it’s too dry add just a touch of pasta water – 1 tbs at a time. Add asparagus to a bowl, wipe out the sauté pan and add pine nuts. Heat pan over medium heat and gently shake the pan till the nuts turn golden brown. Drain penne and add to the asparagus. Toss pasta and asparagus with pesto and toasted pine nuts and serve. 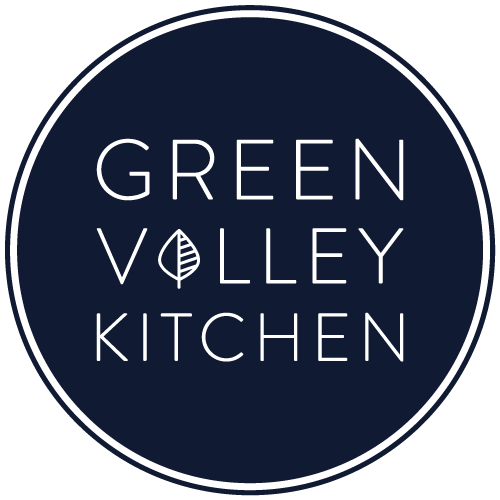 Looking for another fast and tasty pasta dish? Why not try – Pasta with cherry tomatoes, olives and arugula. The recipe uses a no cook sauce that’s a snap to put together. I added sausage! It was SO delicious! Hi Lauren – so glad you liked it! I really appreciate you taking the time to let me know. Have a great night! The asparagus and penne dish was a big hit! Both Jerry and I thoroughly enjoyed it, and I only substituted fusilli for the penne. Combining parsley with basil made the pesto milder, which especially pleased my husband. Thanks, Sandy! You and my mom are my biggest fans :). Looks brilliant. Thanks for the wonderful recipe and great pics. Thanks so much for the compliments, Riya!